Emerging from a long period of obscurity in the East aikido has been called one of the most subtle and sophisticated of the martial arts, and an effective discipline for the development, integration, and utilization of all man's powers, physical and mental (spiritual). What may appear at first glance to be a unique method for efficiently defending yourself against any form or type of attack will reveal itself under careful to be not only an effective method of self-defense derived from Japanese Bujutsu (warrior arts); in addition it is a discipline of coordination, a way of strengthening the mind and body, of fusing the individual's physical and mental powers so that he or she will emerge as a more fully integrated human being. The word in fact, means, "method or way (do) for the coordination or harmony (ai) of mental energy (ki)." 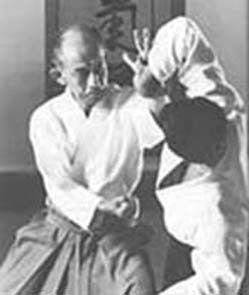 The particular martial art method developed by O'Sensei Morihei Ueshiba which he reffered to as "aikido" combines practical self-defense movements taken from sword and spear fighting, jujutsu, aikijutsu and other ancient, more esoteric forms of martial arts -- with an emphasis from the very first moment of of practice upon a characteristic centralization of thought and action, and the extension of mental energy or ki that makes this such an intriguing art. But why do we say that aikido is unique? Almost every martial art can claim to be an efficient means of self defense and many can be safely practiced by old and young alike. How does aikido differ from all the others? Aikido, purely in its practical application, is an art of self-defense. It is entirely reflexive, and related ethically to defense against unprovoked attack. There is no attack in aikido. When the techniques are applied by aikidoka who have achieved a certain degree of mastery in the art, they will leave no serious injury in their wake. There is the constant reference to the hara, or a man's "centre" (i.e., center of gravity), as the point of concentration of energy; there is the predominance of references to ki, or "inner energy", as the particular form of energy to be employed. Finally, there is the interesting possibility of expanding these concepts and their relevance to areas outside the comparatively restricted world of the martial arts. There is the characteristic strategy (i.e., movements, displacements, techniques) peculiar to the art, and the emphasis upon circularity or "sphericity" in the application of that strategy.